This technical pen set includes line widths of 6x0, 4x0, 3x0, 2x0, 0, 1, and 2. Packaged in a convenient flat shaped, hinged-lid plastic case with a push button release. 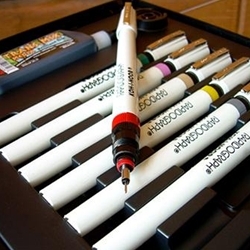 Each set includes a 3/4 ounce bottle of Universal drawing ink and nib keys for changing tips.